In 1919, William Wrigley Jr. purchased Santa Catalina Island. Wanting an island home for his wife, Ada and himself, he sought out the best location in Avalon, which turned out to be at the top of a lovely mountain, with a full commanding view of the island, Avalon and the Pacific beyond. It was the first spot to receive the morning sun and the last of the afternoon sun as it dipped behind the mountains. Wrigley named the mountain top Mt Ada. In asking his wife what she would like the house to look like, Ada answered that she had always wanted a house with dark green shutters. Returning from Chicago the following year, Mrs. Wrigley arrived on the island to find this lovely Georgian Colonial Mansion with dark green shutters. The home was completed in 1921. “L” shaped, the mansion wraps around a formal motor court entry on the mountain side, and a grand staircase of over 100 stairs, leading up to the home from the ocean side. Mrs. Wrigley was fond of succulents and cactus and had the garden planted with a number of unique species. The home was originally designed using her own ideas, involving three stories, a Turkish bath, billiard room, organ chamber, and a refrigerating room. There were also six bedrooms, a sun room, and an elegant terrace porch. However, many of these original design details were modified or removed entirely such as the entire third floor of the home. 1921 is also the year that Mr. Wrigley decided to have his baseball team, the Chicago Cubs, hold Spring Training on the island. Although Mr. Wrigley usually watched the training from the bleachers, he had made sure he could watch them from his mansion office as well. 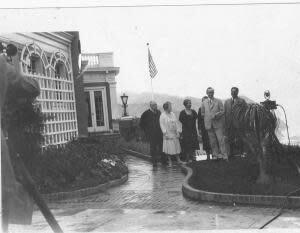 The Wrigley&apos;s enjoyed their time on the island and would visit at least twice a year until Mr. Wrigley’s passing in Arizona in 1932. They entertained Presidents, royalty and princes of industry, but mostly enjoyed island living, the Chicago Cubs and the community of Avalon. Mrs. Wrigley continued to love and visit the home after her husband&apos;s death. During the 1960’s, visitors could tour the mansion until the Wrigley family donated it to the University of Southern California to use as a Marine Science Center. In 1985, the property was leased to a private party who set about re-creating Mt Ada as a bed and breakfast. They turned it into a highly successful venture which has been awarded the Mobil Travel Guide 4-Star rating, Conde Nast’s “Best in the World” Readers Choice Award, the Forbes Four Star Award and several TripAdvisor Certificates of Excellence. Mt. Ada is now managed by the professional hospitality team of the Catalina Island Company.